– Yury Fedotov, Executive Director of the UN Office on Drugs and Crime (UNODC) addressing member states at the November 2015 Anti-Corruption Forum. According to a summary produced by the group, Transparency International, the United Nations Convention against Corruption’s (UNCAC) main focus is aimed at promoting the prevention, detection, sanctioning and criminalization of corruption. The convention, which was adopted in 2003 by 111 nations, has increased since then to now 177 of the 196 nation states in the world. Belize would be the number 178th nation if the convention is ratified. 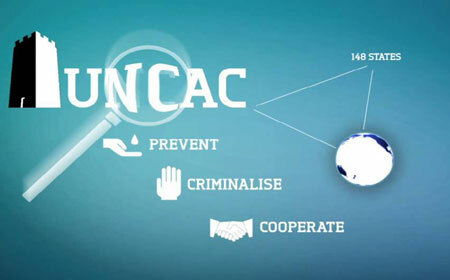 While the UNCAC contains eight chapters, generally speaking, it has four core pillars, with emphasis on prevention, criminalization, and more importantly international cooperation, and asset recovery. Stapled to the convention, is the fundamental principle of accountability and transparency; of citizens and civil society, holding governments, public officials and officers accountable by internationally agreed standards, as it pertains to anti-corruption performance at both the public and private sector level. In Belize’s case, this is something which has been widely agitated for by the Belize Chamber of Commerce and Industry (BCCI), civil society and the citizenry at large prior to 2008, and rightly so, given our past experiences. The general sentiments of the BCCI and a large portion of society, is that the UNCAC should have been ratified without much forbearance. Chapter II of the UNCAC sets out the preventative measures in the fight against corruption. It sets out preventive anti-corruption policies and practices, the setting up of an anti-corruption body, the strengthening of systems for recruitment, hiring, retention, promotion and retirement of civil servants, based on a transparent process involving merit, equity and aptitude. In addition, it speaks to a code of conduct for public officials, as well as the process for procurement of contracts, public and private sector reporting/whistleblower protection and the participation of civil societies such as the BCCI, in the prevention of corruption. Chapter III provides for the criminalization of bribery of public officials, foreign public officials, and officials of public international organizations. It also speaks to state parties in adopting criminal offences to address the embezzlement, misappropriation and diversion of property by a public official for his or her own benefit. Additionally, State Parties are required to criminalize the obstruction of justice, concealment and conversion of criminal proceeds by public officials. Encouraged, but not a requirement, is the acceptance of bribes by foreign and international public officials, illicit enrichment, bribery and embezzlement within the private sector. Of consequence within Chapter III, is the enforcement and prosecution framework, the overly important whistleblower and witness protection matters, as well as recommendations for corruption such as the freezing of assets and compensation of victims. Aside from its robust and wide-reaching arms, of significance is the fact that the UNCAC provides greater teeth to state parties in addressing some of the many cross-border challenges that has, and is still prevalent today in enforcing and prosecuting wrongdoing in other similar implemented conventions such as the Anti-Money Laundering and Counter-Terrorist Financing Act (AML/CFT). This is captured in Chapter IV Article 43, wherein the UNCAC speaks on mutual cooperation of State Parties in criminal matters both at the civil and administrative levels relating to corruption. It addresses, and mandates, international cooperation where domestically and legally applicable, between state parties; an issue that has long been a stumbling block and barrier for effectively implementing conventions such as the aforementioned AML/CFT. The experience as it pertains to AML/CFT has been that law enforcement agencies across the globe have been facing many problems in prosecuting cross-border crimes, ranging from legal protection under various bank secrecy laws, lack of assistance from some jurisdictions, and overall difficulty in prosecuting due to often complex laws and loopholes. And while some of these gaps have since been addressed in most common law jurisdictions with the passage of conventions such as the Criminal Justice Act (CJA) and the Proceeds of Crime Act (2002), the fact of the matter is that international cooperation between State Parties has always been a bone of contention. The UNCAC seeks to tackle that matter and also provides for the extradition of persons under certain conditions, mutual legal assistance between state parties, and transfer of criminal proceedings, law enforcement cooperation, joint investigations and the implementation and use of investigative techniques to ensure successful prosecution. Of significant prominence in the entire UNCAC process was the right of State Parties to recover stolen national assets. This was an essential component, and precious to many State Parties, particularly many of the developing nations, such as Belize. “This evil phenomenon is found in all countries—big and small, rich and poor—but it is in the developing world that its effects are most destructive. Corruption hurts the poor disproportionately by diverting funds intended for development, undermining a Government’s ability to provide basic services, feeding inequality and injustice and discouraging foreign aid and investment. Corruption is a key element in economic underperformance and a major obstacle to poverty alleviation and development,” said Kofi A. Annan Secretary-General. This is provided for in Chapter V of the Convention, as it lays out a clear road-map for State Parties to legislatively adapt to enable the direct recovery of property. It lays out the mechanism for recovery of property through international cooperation in confiscation, return and disposal of assets. It also encourages the cooperation between Financial Intelligence Units in combating the transfer of proceeds of crime and also makes provision on ways to recover such funds. Finally, Chapter VI of the Convention focuses on technical assistance for State Parties in the implementation the UNCAC framework. It speaks to support aimed at helping countries comply with the UNCAC’s provisions. It addresses training in investigative methods, content, human resources requirements, research, and information sharing. It also provides guidance in the area of the development of strategic anti-corruption policies, methods used to protect victims and witnesses in criminal cases as well as mutual legal assistance and methods to strengthen public financial management.